Monica Neomagus lives in Amsterdam and worked from 1998 through 2013 at Mozes & Aäronchurch, a centre for community-building that supported the Charter for Compassion in Holland since its November 2009 launch. She has been involved in many activities related to the Charter, such as courses/lectures on compassion, a concert for compassion, a video on young people & compassion and a book of stories of compassion set in Amsterdam. 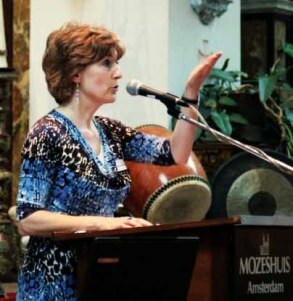 She also coordinated meetings of the Dutch Charter for Compassion network in several cities/organizations and is a co-organizer of the annual Dutch Compassion Award. She and several other dedicated and inspired ‘Dutch compassionates’ started the Dutch Charter for Compassion Foundation in September 2014. Monica Neomagus started her career as a social worker for prisoners. She also coordinated projects for homeless people and victims of (severe) traffic accidents and taught courses to people without jobs. Her theological training made her aware of the great importance of the interreligious dialogue. She taught a course on world religions to primary-school children and initiated the creation of the program “Parents in Dialogue,” in which parents with different religious backgrounds share their ideas on important values in relation to bringing up children. She currently works as a guide for those who retire from work in finding new, creative and meaningful ways to live and cope with growing older.